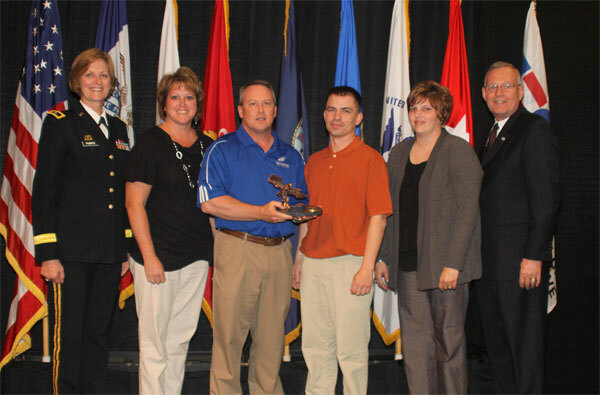 Des Moines, IA (April 14th, 2012) – Den Hartog Industries, Inc., a small business employer has received the 2012 ‘Pro Patria’ Award – the highest award in the State of Iowa – for their support of employees who serve in National Guard and Reserve military units. The ‘Pro Patria’ Award is presented each year by the Iowa Committee of the Employer Support of the Guard & Reserve (Iowa ESGR). John G. Den Hartog, President of Den Hartog Industries, his wife Jeanne Den Hartog along with Den Hartog Industries’ employee, Shawn Broesder and his wife, Jessica, were present at an April 14th ceremony in Des Moines, IA where the award was presented. Civilian military members in the Guard and Reserve have their employment protected under Federal Law. The Uniformed Services Employment and Reemployment Rights Act (USERRA) provides guidance on the rights and obligations of employees and employers with respect to military service. 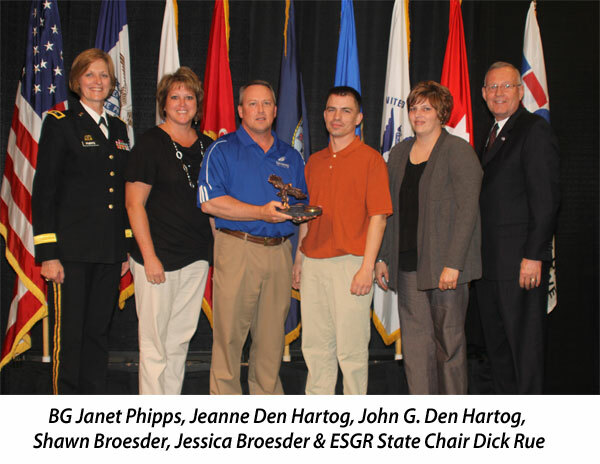 The Iowa ESGR annual awards are presented to employers who exceed the USERRA Requirements. Kooima Company of Rock Valley and Spencer Municipal Hospital were the only two other Northwest Iowa companies to be recognized. Each year, the Iowa ESGR selects the top employers from among those nominated by military employees to receive ‘Above & Beyond’ Awards. Twenty-three employers were selected to receive the 2012 ‘Above & Beyond’ Awards. These awards recognize employers that have gone above and beyond the legal requirements for granting leave and providing support for military duty by their employees. From these ‘Above & Beyond’ recipients, the ESGR selects three to receive the ‘Pro Patria’ Award. The ‘Pro Patria’ Award is presented annually by the state ESGR committee to one small employer, one large employer, and one public employer that has provided the most exceptional support of our national defense through leadership practices and personnel policies that support their employees who serve in the National Guard and Reserve. The Department of Defense established Employer Support of the Guard and Reserve in 1972. The mission of ESGR is to gain and maintain active support from all public and private employers for the men and women of the National Guard and Reserve. ESGR volunteers provide free education, consultation, and if necessary mediation for employers of Guard and Reserve employees. Made up largely of volunteers, the ESGR has 150 volunteer members across Iowa.